AP1530 consists of Step-down Switching Regulator with PWM control. These devices include a reference voltage source, oscillation circuit, error Amplifier and internal PMOS. AP1530 provides low-ripple power, high efficiency, and excellent transient characteristics. The PWM control circuit is able to vary the duty ratio linearly from 0 up to 100%. This converter also contains an error Amplifier circuit. An enable function, an over current protection and a short Circuit Protection are built inside, and when OCP or SCP happens, the operation frequency will be reduced from 300kHz to 50kHz. Also, an internal compensation block is built in to minimum external component count. By Diodes, Inc. This is one package pinout of AP1530,If you need more pinouts please download AP1530's pdf datasheet. 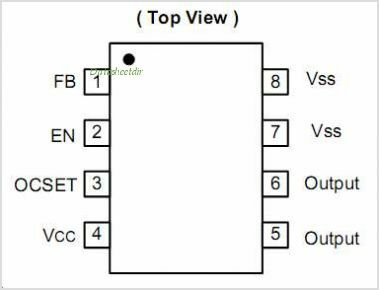 This is one application circuit of AP1530,If you need more circuits,please download AP1530's pdf datasheet.